When I returned to the village of Cocking on the morning of Good Friday, the weather was very different to the previous day -- about ten degrees warmer, sunny and with much better visibility. 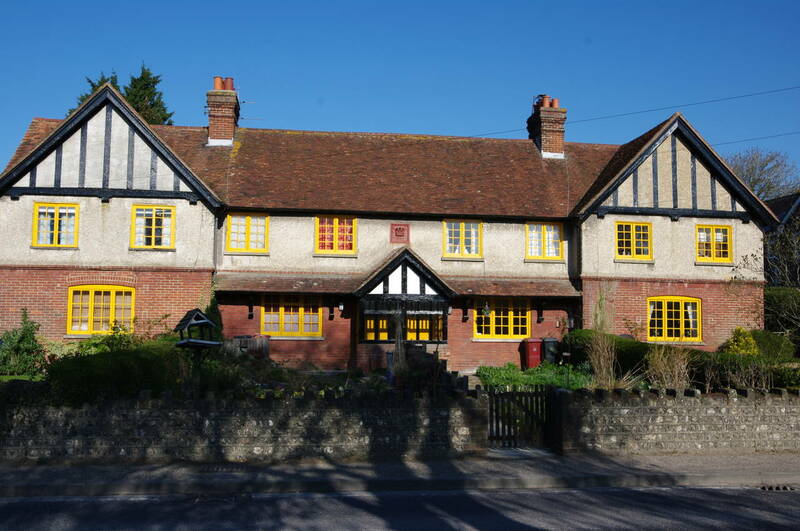 Before leaving the village, I went for a stroll along the main road, where several of the cottages and houses have bright yellow doors and window frames (pictures 1 and 2) to indicate that they belong to the Cowdray Estate, which also owns several nearby areas of the South Downs. 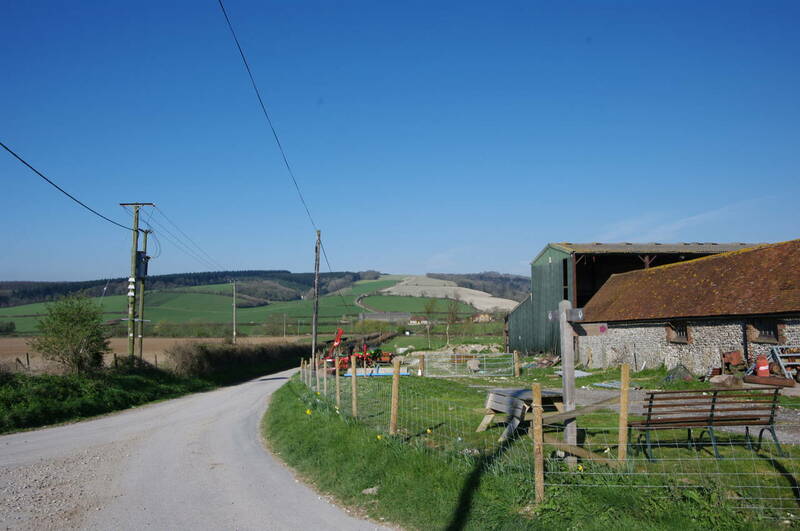 Heading down the lane beside the village store, I retraced my steps back to Manor Farm (picture 3), where I had left the South Downs Way the previous afternoon. 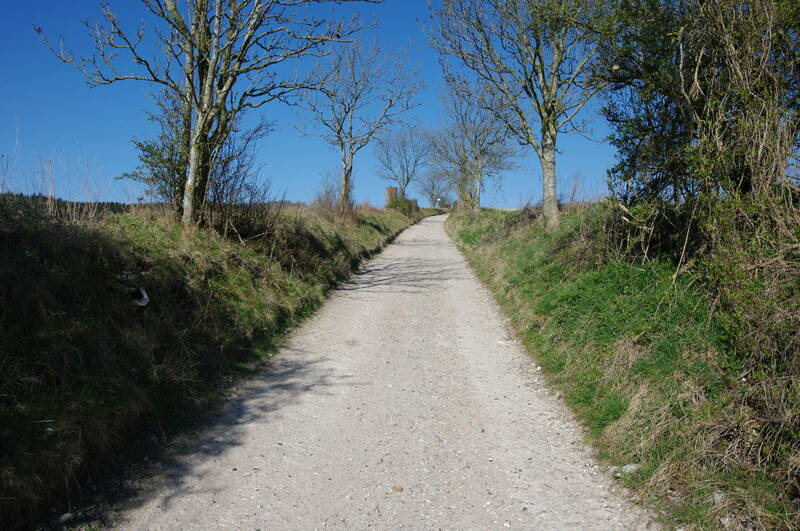 The Way follows Hillbarn Lane the short distance down to the A286, which the route crosses before continuing ahead on a track through the middle of Cockinghill Farm (picture 4), where about a dozen cyclists were milling about getting ready for a ride along the downs. Beyond the farm the path begins to climb fairly steeply up to Cocking Down on broad track (picture 5), which several more cyclists came zooming down rather rapidly. 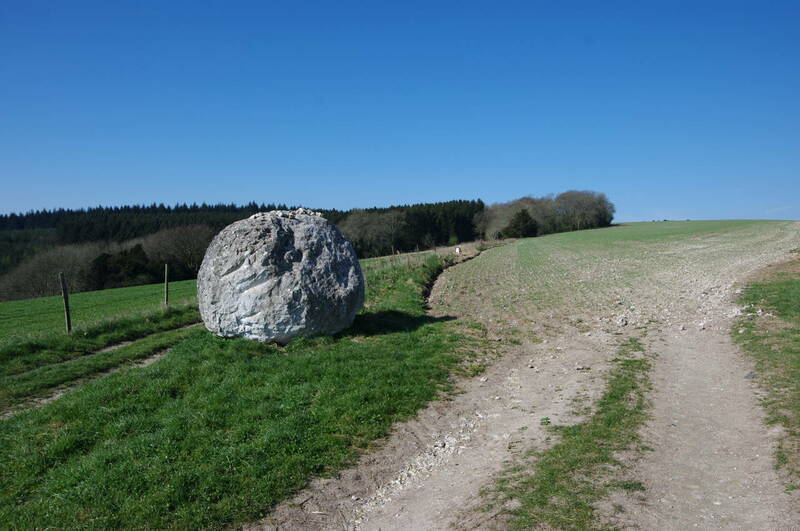 As the path levelled out, there were good views back to the village of Cocking (picture 6), while beside the path was a big ball of chalk, almost two metres tall (picture 7). 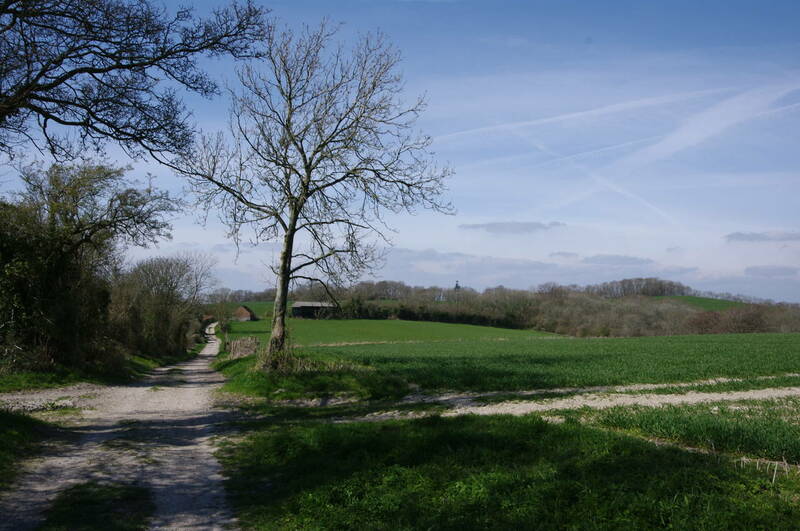 The path continues west, passing close by the wooded Stead Combe and along the ridge of Linch Ball, from which there are views southwest towards the coastal towns of Emsworth and Havant (picture 8). 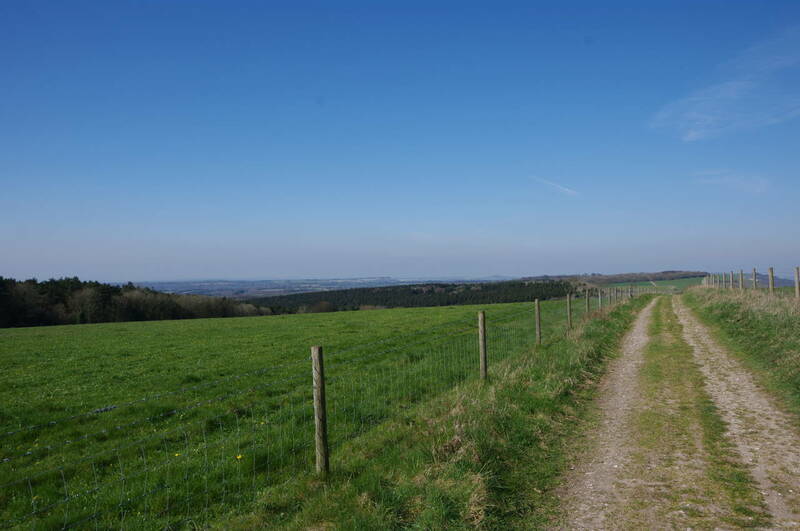 The path passes about a hundred metres from the trig point on top of Linch Ball before continuing on over Diding Hill (picture 9), entering the tangled woods of the Monkton Estate and bending around to the southwest. 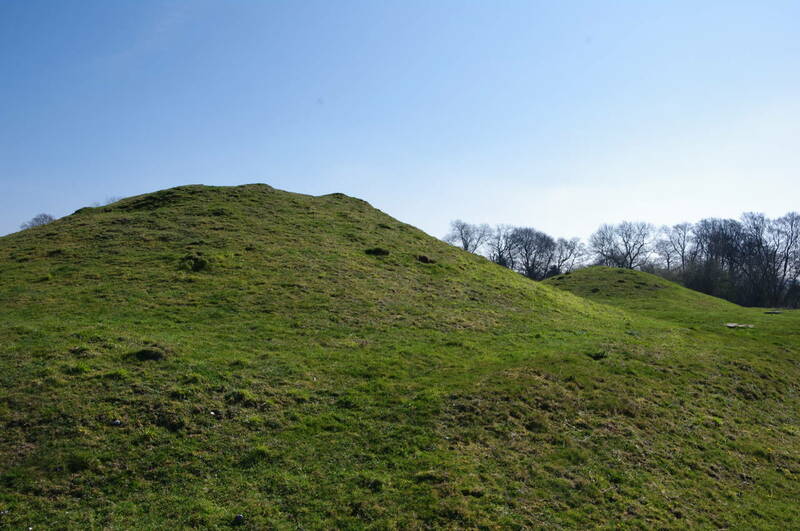 About a kilometre into the woods is a large field containing a group of Bronze Age burial mounds known as The Devil's Jumps (picture 10), estimated to be at least three thousand years old. At a fingerpost a short side-path leads into the field for a closer look at the mounds (picture 11), which are a good deal larger than the tumuli the path passed the day before. 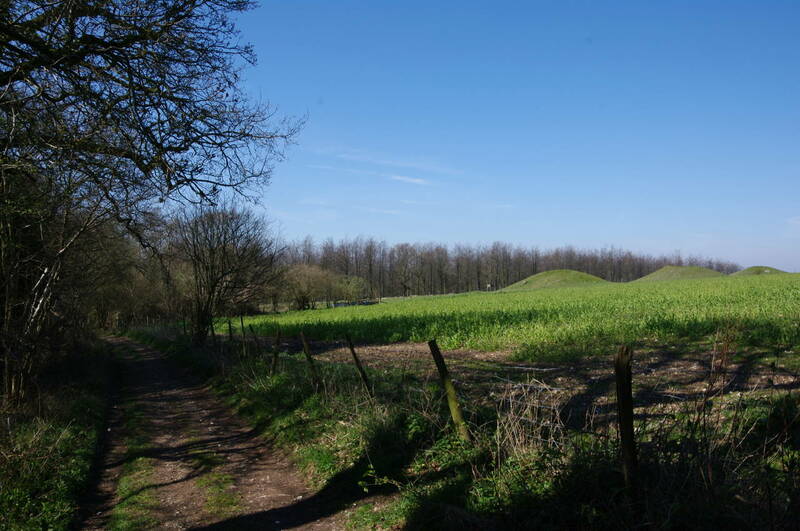 The largest mound is 34 metres in diameter and 4.8 metres high. 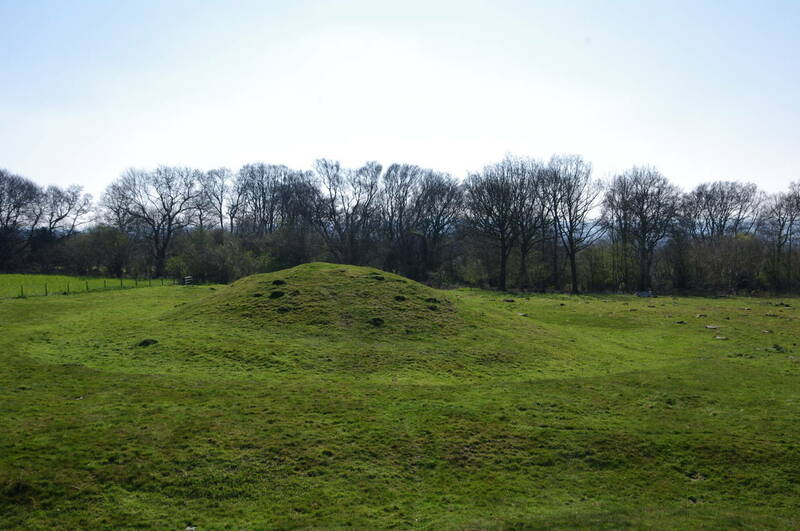 Up close, you can see that each mound is surrounded by a ditch from which some of the earth for the mound was taken (picture 12). In all, I counted seven mounds in the field. 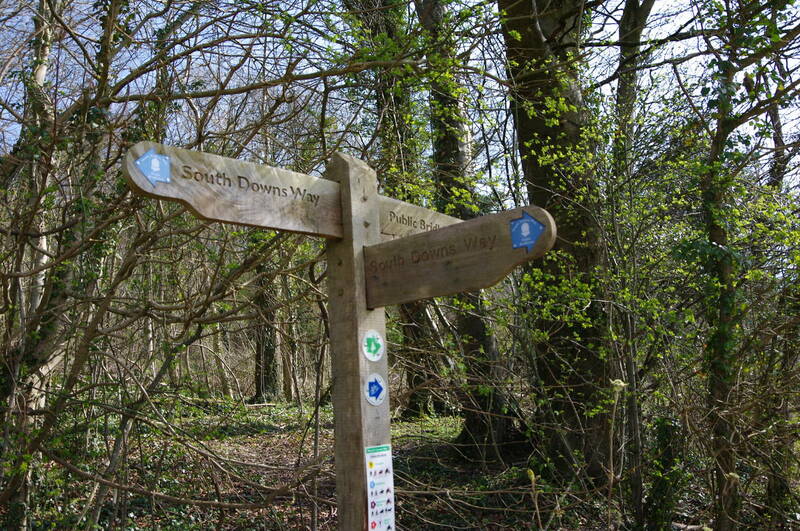 Returning to the South Downs Way, the path heads through the woods for a few hundred metres before the route turns sharply to the right at a junction of tracks. 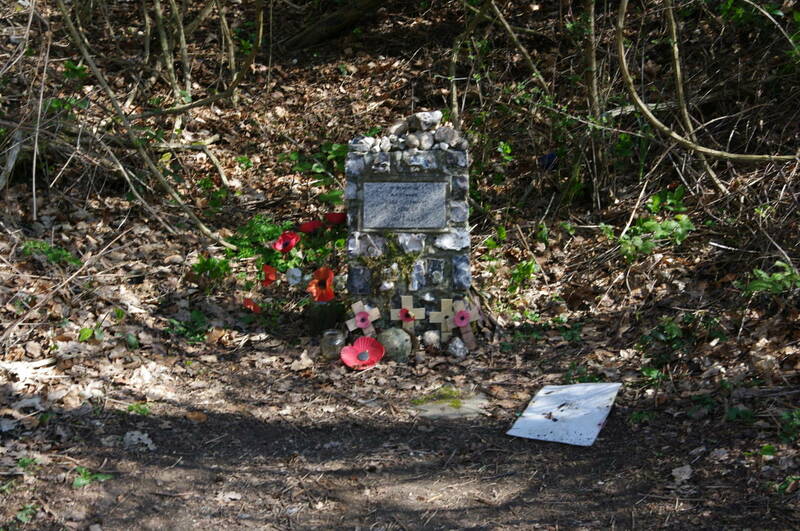 Heading northwards now through the woods of Philliswood Down, the path passes by a small memorial to Pilot Hauptmann Joseph Oestermann, 1915-1940 (picture 13); presumably a German airman killed in World War II. 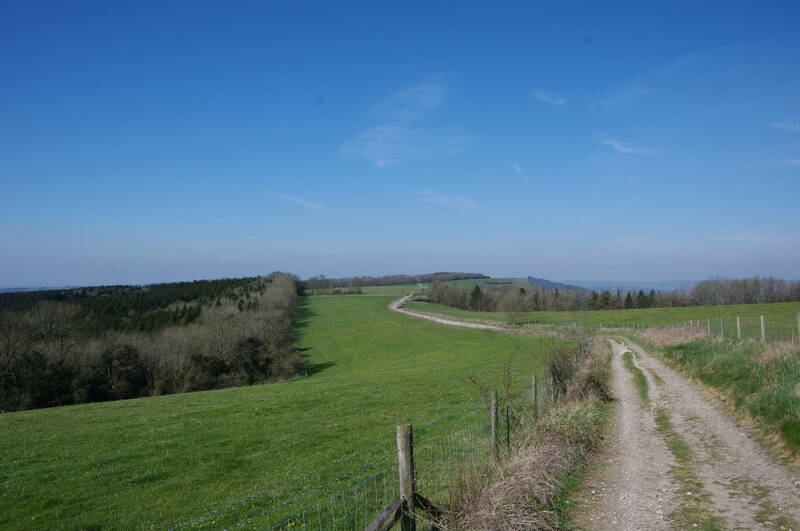 Emerging from the woods, the track descends into a shallow valley occupied by Buriton Farm (picture 14). 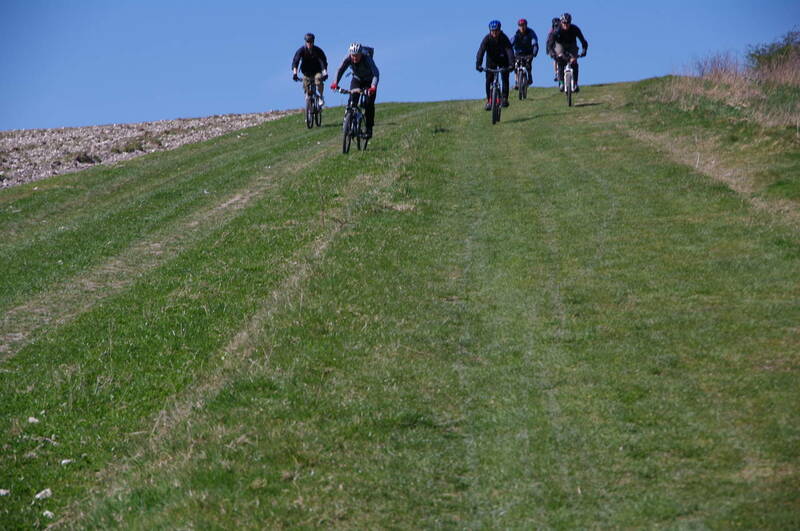 After crossing the valley the track runs along the edge of woods for a short distance before turning westwards again and climbing steeply up the grassy Pen Hill, where half a dozen brave mountain-bikers flew down the hill in the opposite direction (picture 15). 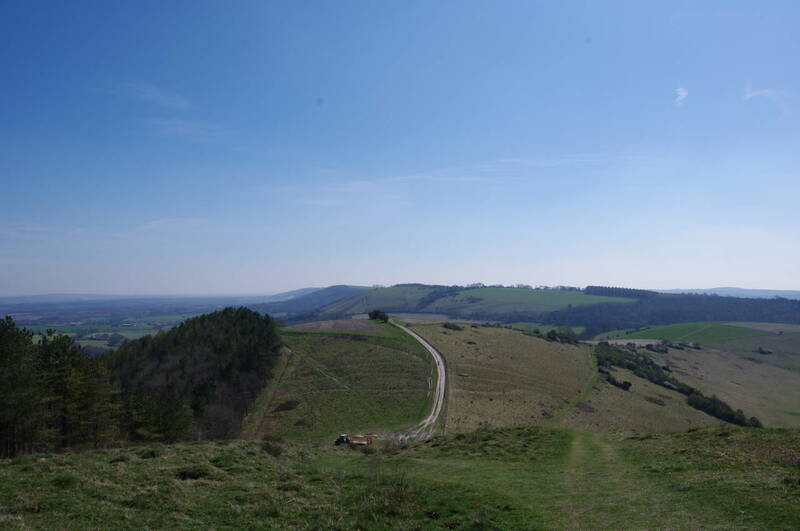 Reaching the crest of Pen Hill, the view of the path ahead is of a steep descent followed by an even steeper climb up Beacon Hill (picture 16). At the bottom of the descent the Way splits with an easier alternate path for cyclists and horse-riders heading left around the hill and the path for walkers heading steeply straight up the hill. 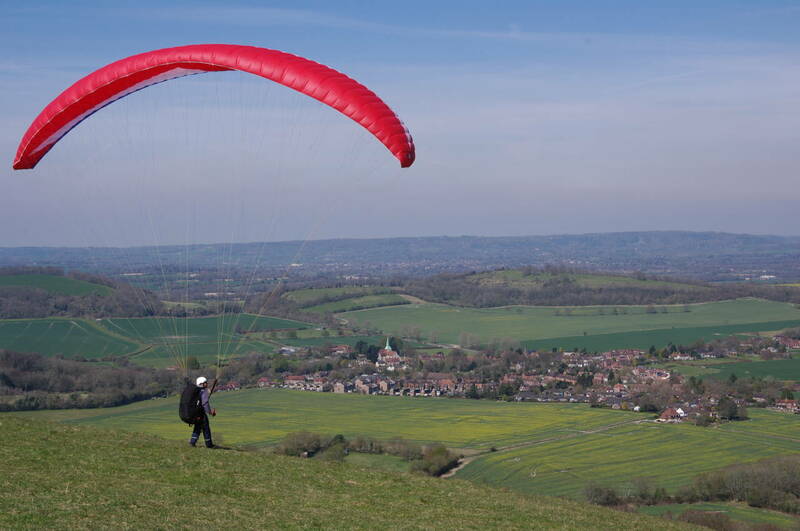 The strenuous climb up Beacon Hill was worth it for the view back along the downs (picture 17). 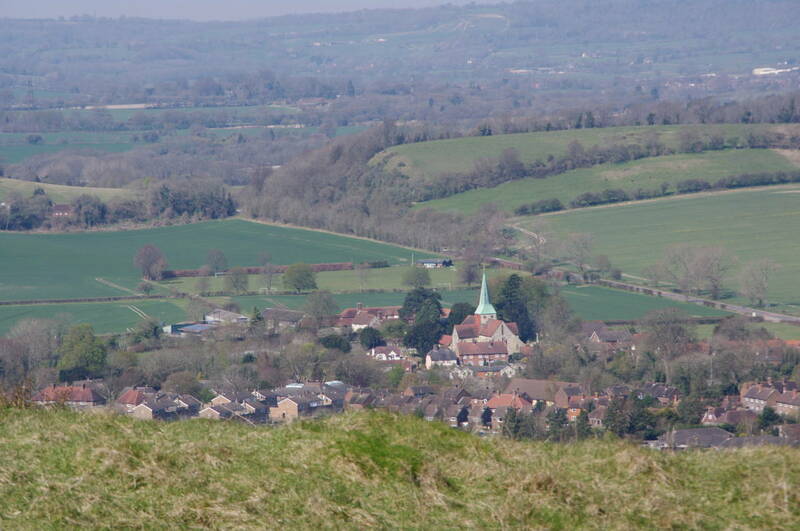 The grassy path passes just to the right of the trig point on top of the hill and soon begins to descend down the steep western side of the hill, from which there are views ahead to Harting Down and the twin villages of East Harting and South Harting (picture 18), where the tall church spire stands out (picture 19). 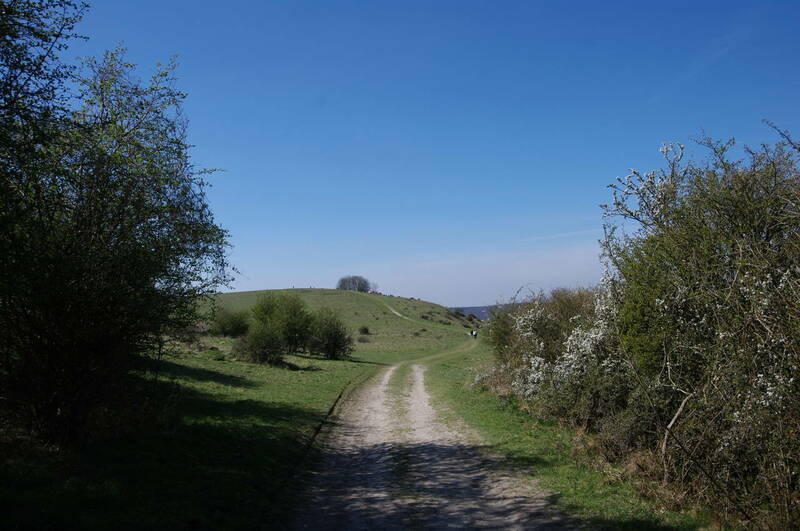 After the steep descent from Beacon Hill, the path crosses a grassy valley before heading into trees and a more gentle uphill climb to Harting Down (picture 20). 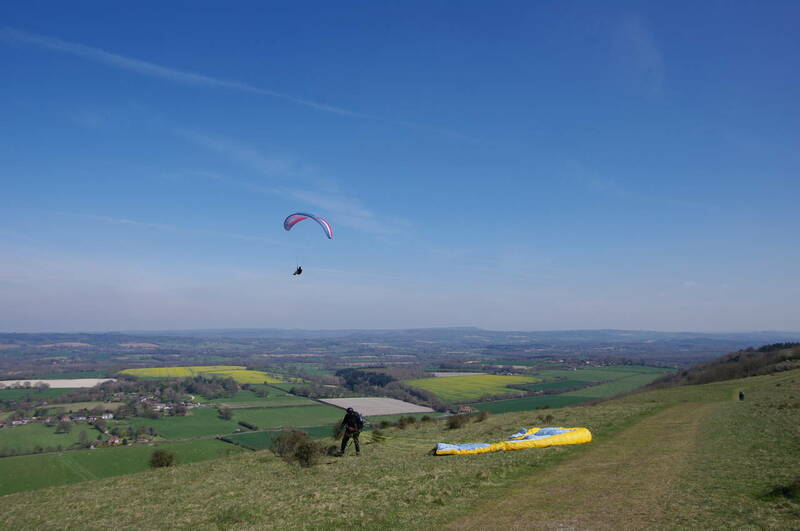 Harting Down seemed to be a very popular place, with dozens of walkers and cyclists heading up and down the hill. 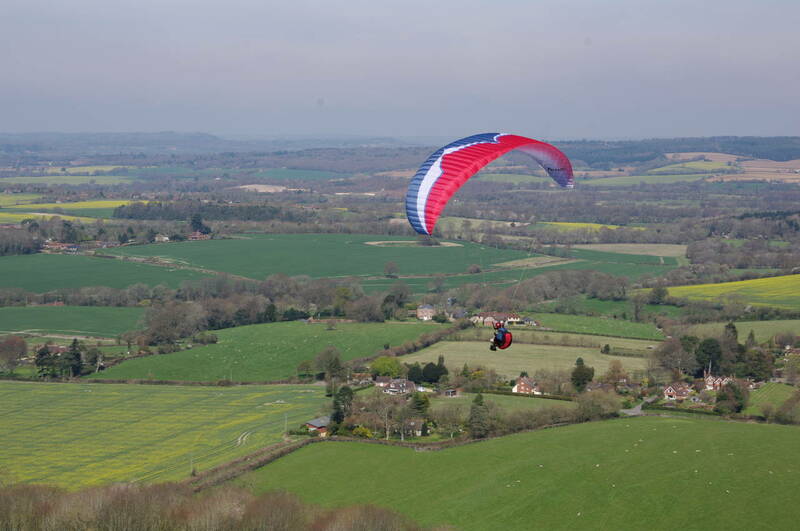 As I got close to the top, the wind started picking up and a pair of parasailors began to launch themselves from the steep northern slope of the hill, with South Harting in the background (picture 21). 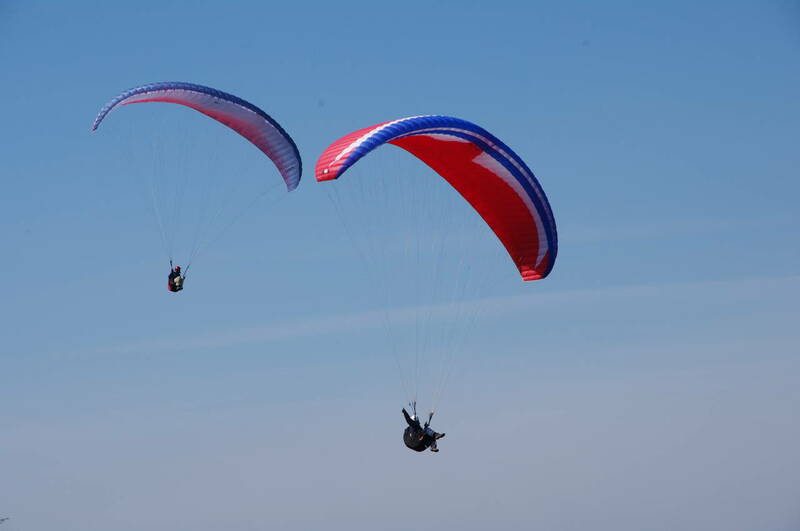 After a few short flights along the face of the hill (picture 22), and at least one rather hard landing (picture 23), the parasailors became more adventurous, climbing higher on the stiff breeze (picture 24). 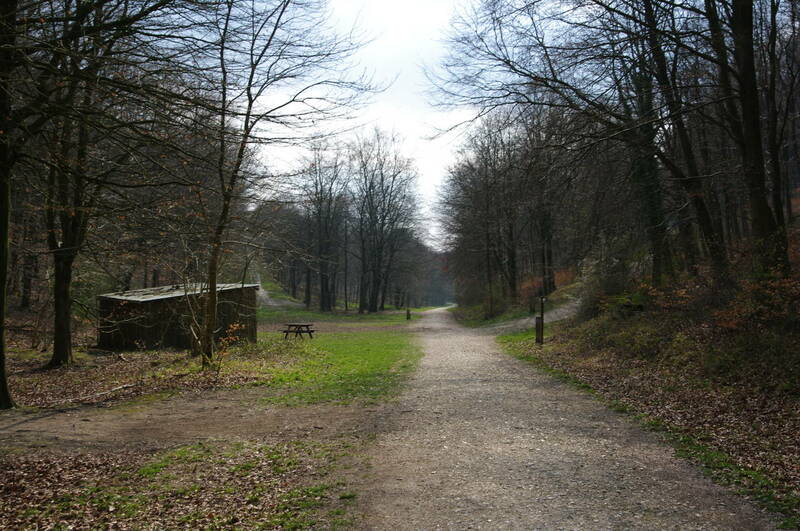 From Harting Down, the path descends through woods (picture 25), soon crossing the B2141 road and then runs parallel to the road, following a shady, level trail along the contours of the steep hillside above the road. 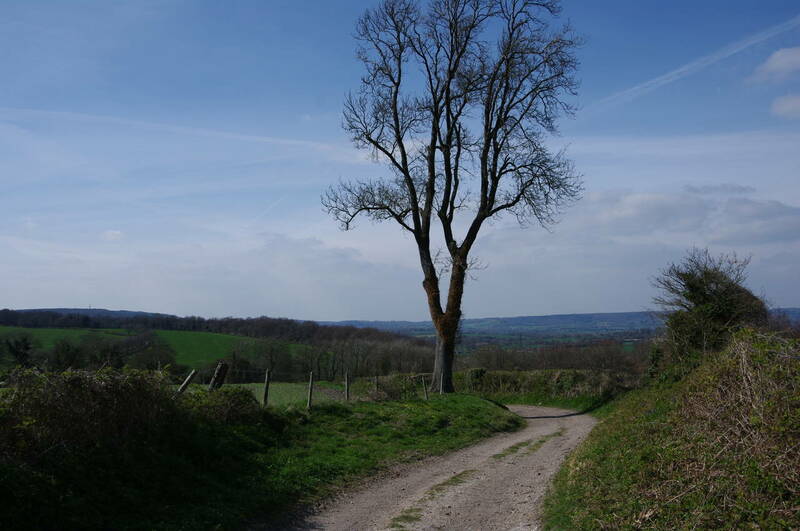 After about 800 metres the path crosses the B2146 road which comes up the hill from South Harting. 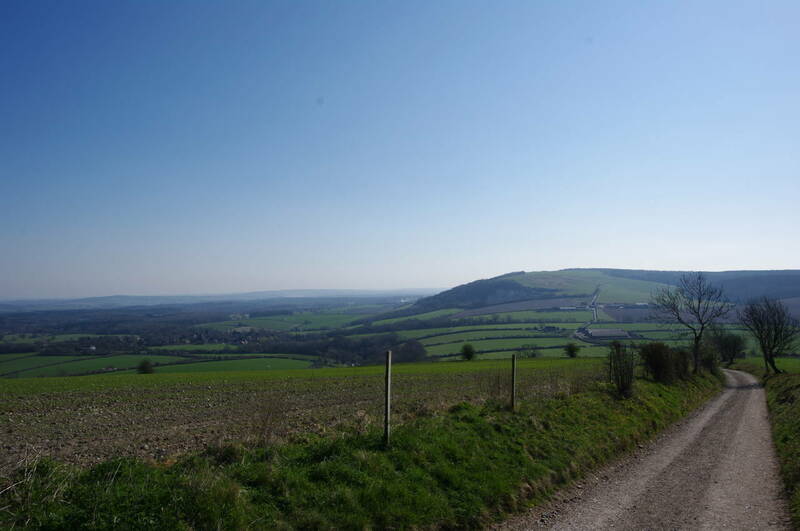 From the small carpark by the road, the South Downs Way heads west, but I left the main path and followed a footpath downhill through the woods for about ten minutes to reach the village. 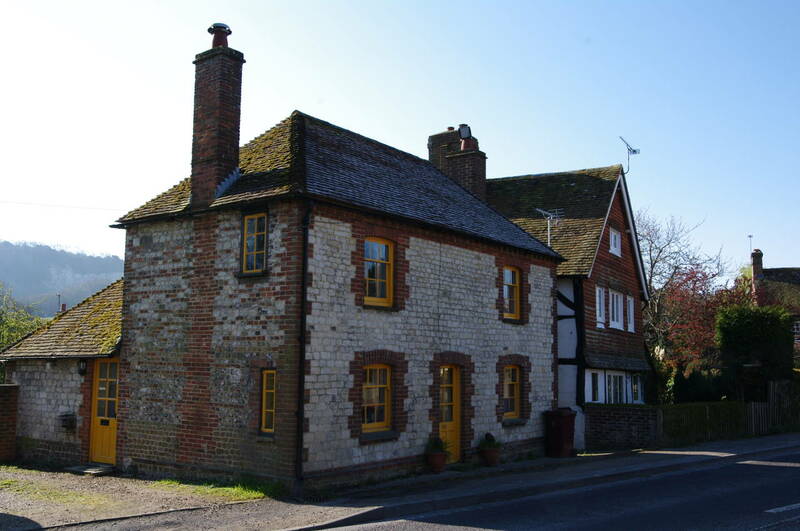 The path emerges onto the main road through the village, which is too narrow to have a footpath as it heads between houses and the Church of St Mary and St Gabriel (picture 26). 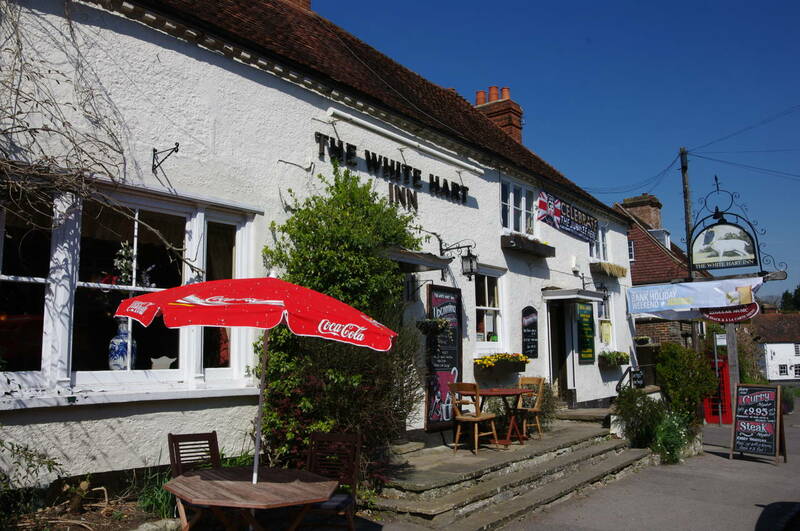 Just beyond the church stands the White Hart Inn (picture 27), and a little further is the Ship Inn (picture 28), where I stopped for lunch. The Ship, which is so named because it was built from the timbers of old ships, has earned a good reputation for its fish pie and its selection of ales. On the day of my visit there were four ales from the Palmers Brewery, which has been brewing in Bridport, Dorset, since 1794. Shortly after I sat down to a serving of fish pie (which was delicious) and a pint of Palmers Copper Ale, a family took up residence at the next table, having driven all the way over from the east coast of Kent just to have lunch in this pub. 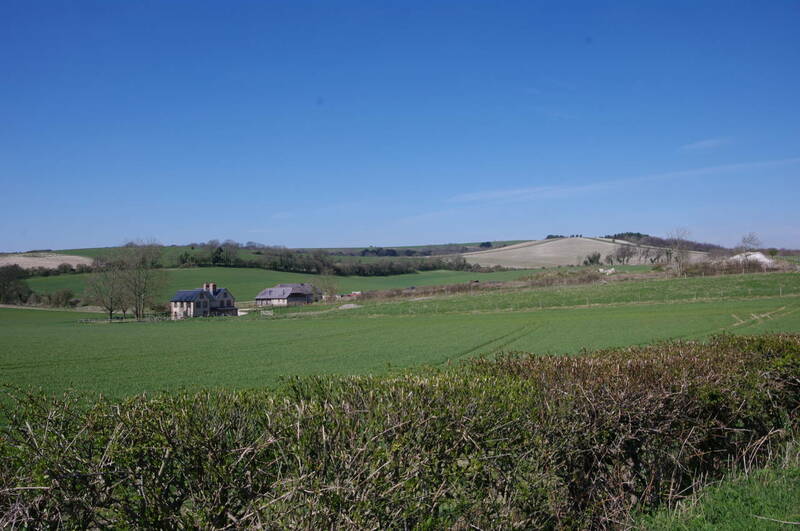 From the carpark by the B2146, the Way heads a little north of west across the undulating downs on a track known as Forty Acre Lane, with woods to left and a succession of large fields to the right (picture 29). 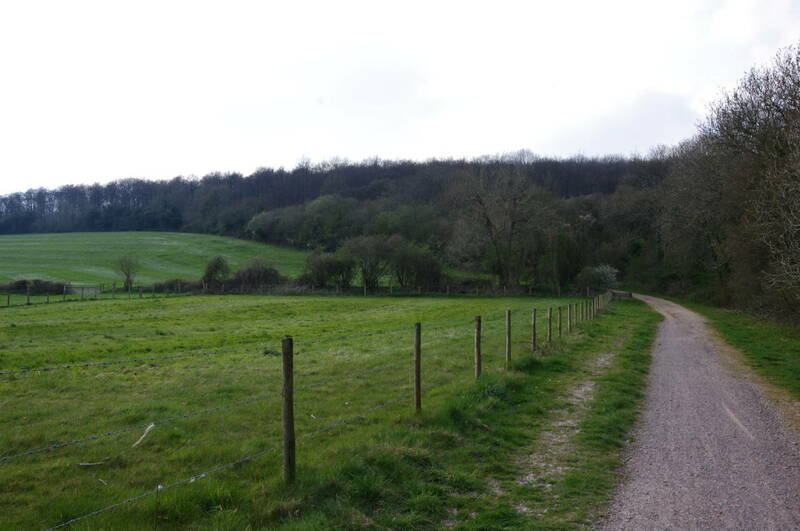 After around two and a half kilometres, the path begins to descend from the hill of Hundred Acre (picture 30) and somewhere along here the Way crosses the unmarked border between the counties of West Sussex and Hampshire. 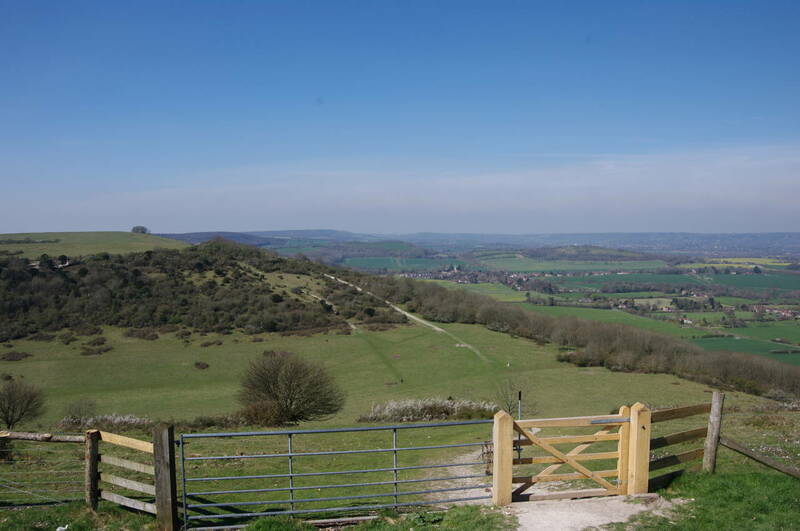 The county boundary was the official end of the South Downs Way until the trail was extended to Winchester in 1989. 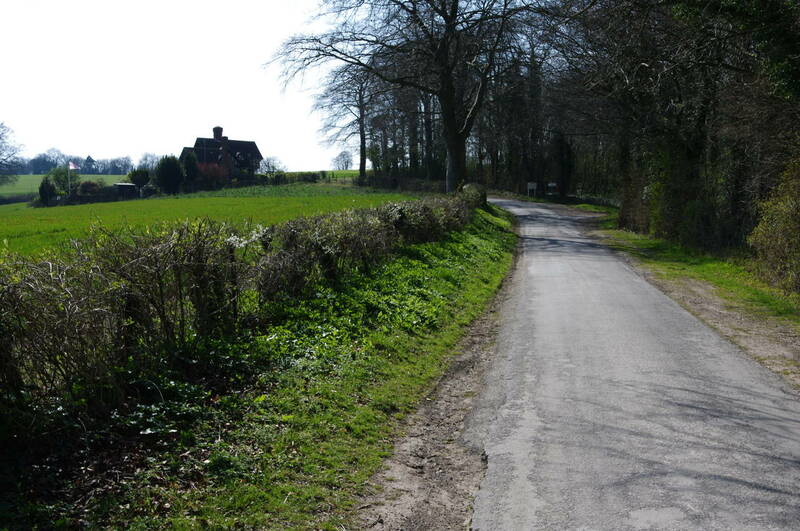 The first obvious clue to having crossed into Hampshire was that the style of the signposts had changed from the familiar symmetrical arrow shape to the more traditional fingerposts (picture 31), the first of these indicating that the route kinks left then right between the buildings of Sunwood Farm. Here the track becomes a lane which heads west between hedge-bordered fields to reach a three-way junction in front of North Lodge (picture 32). The Way takes the right branch, which descends through the woods of the Coulters Dean Nature Reserve. On the far side of the woods the lane becomes a track once again and turns left then right to navigate around the perimeter of another hedge-lined field before the track starts to climb another hill. 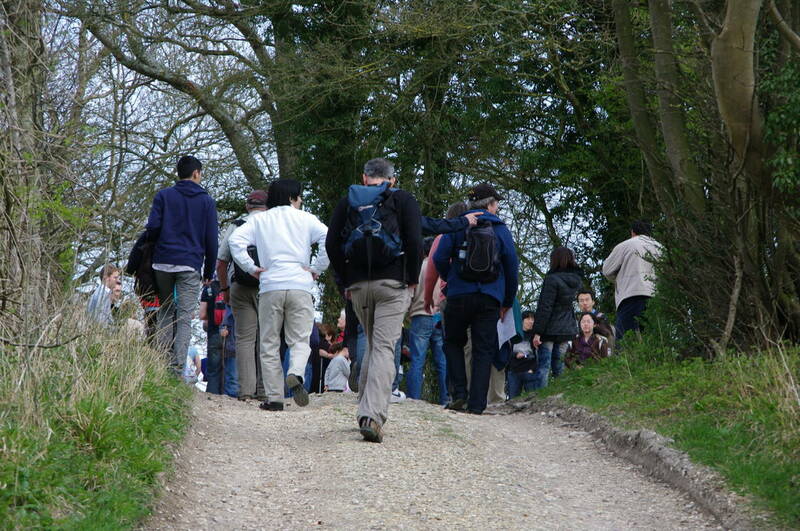 Before long I had caught up with a large group of walkers (probably close to a hundred in all) ambling rather slowly up to the top of the hill (picture 33). 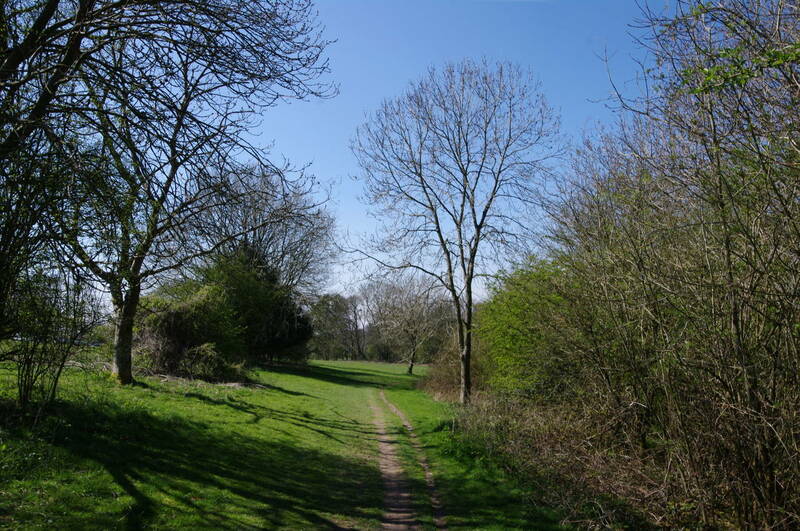 Soon passing them, I followed the track downhill again to Dean Barn, where the track turns back into a surfaced lane, which continues to descend through the trees of Appleton Copse to reach an intersection beside a carpark. Turning right here leads down the quiet Kiln Lane to the village of Buriton, but instead I continued ahead through the carpark and onto a track which soon curves to the left and climbs in a southwesterly direction over Halls Hill, part of the Queen Elizabeth Country Park (picture 34). The climb is not very steep and before long the path was gently descending again, passing a couple of picnic sites (picture 35) before reaching a small carpark and continuing ahead beside one of the park's access roads. 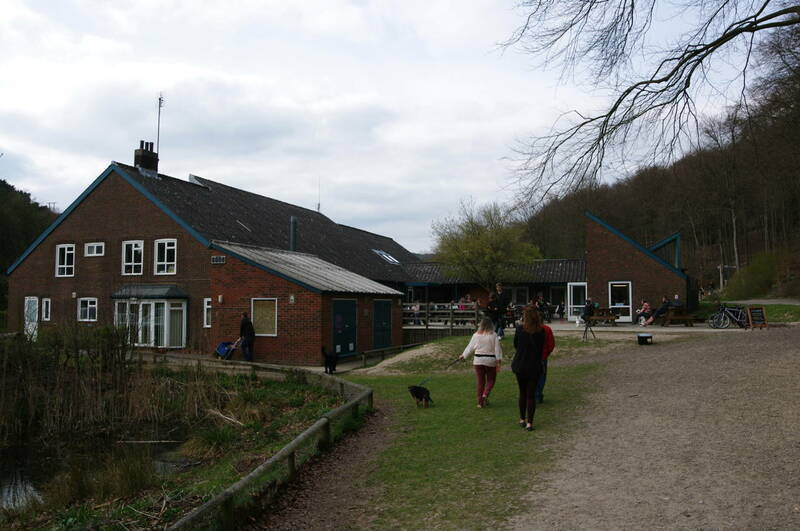 Reaching a larger carpark, the path turns sharply northwards, crosses the road and follows a footpath up to the park's large Visitor Centre (picture 36). 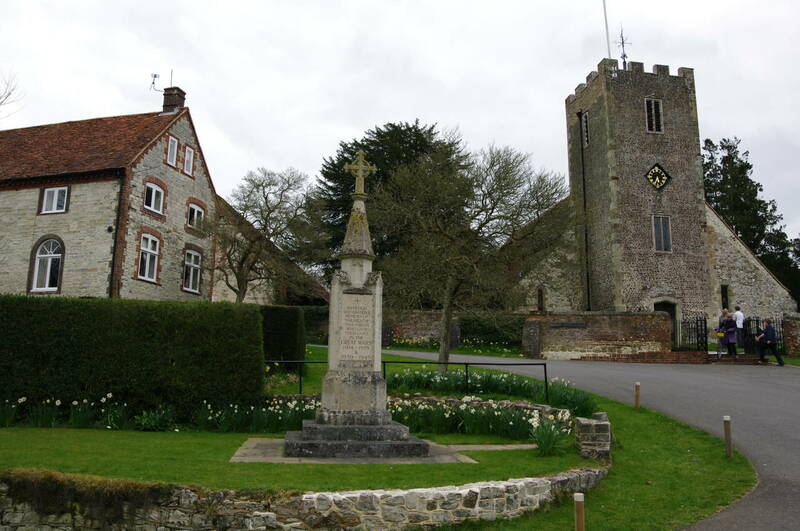 Had it not been Good Friday, it would have been possible for me to continue along the South Downs Way for another nine kilometres to the village of East Meon, as it was still almost four hours until sunset. 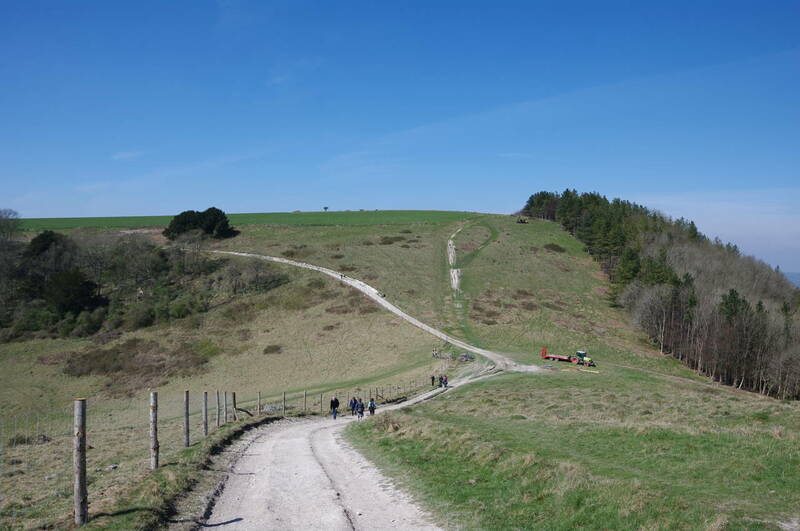 However, as my research had shown that there was no public transport from either East Meon or the country park on public holidays, I left the South Downs Way at the Visitor Centre, having completed a further nineteen kilometres of the official route. Retracing my steps through the country park and then down Kiln Lane, it took me about 45 minutes to reach the village of Buriton. 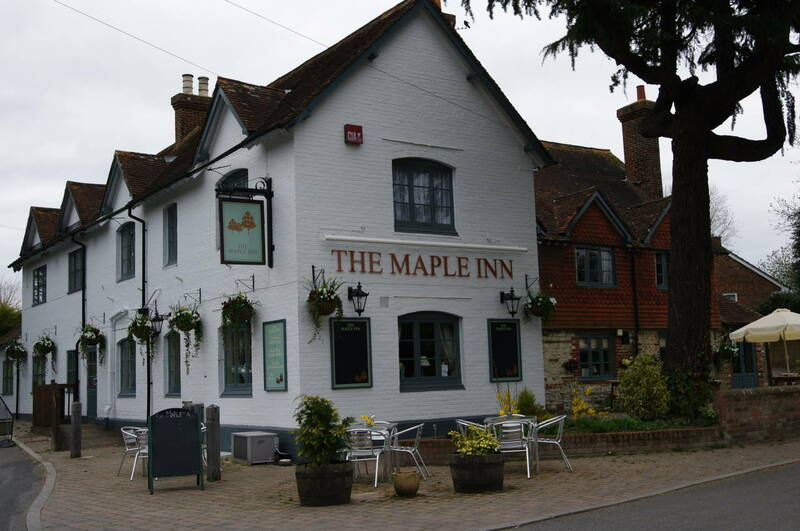 Half-way along the main street, the modern-looking Maple Inn (picture 37) stands by the intersection with South Lane. 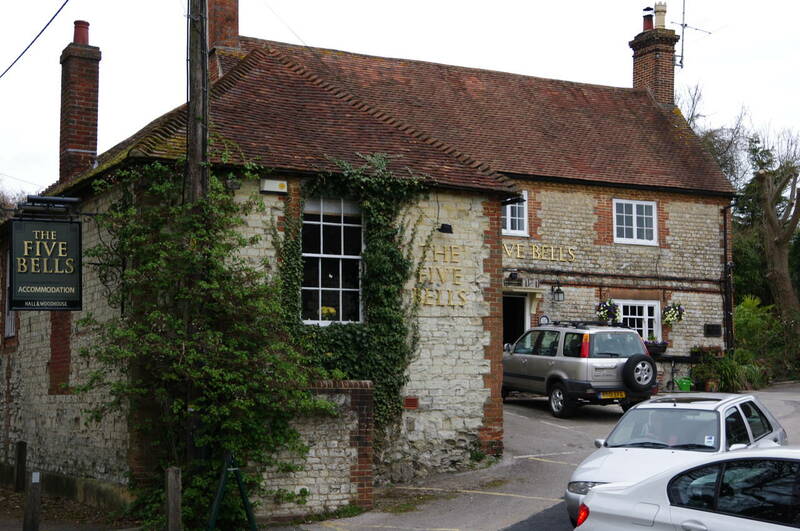 The pub seems to have had a change of identity recently, as it was named the "Master Robert" on my map. 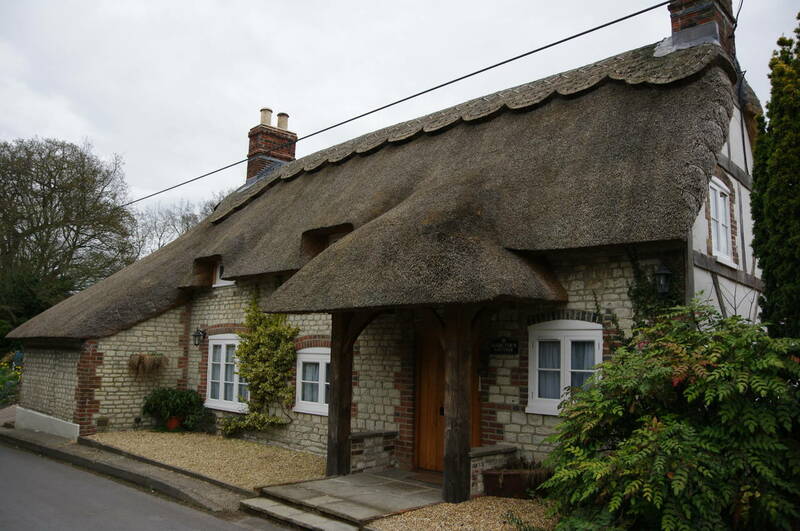 I turned along South Lane, passing an attractive thatched cottage (picture 38), and then the Five Bells pub (picture 39). 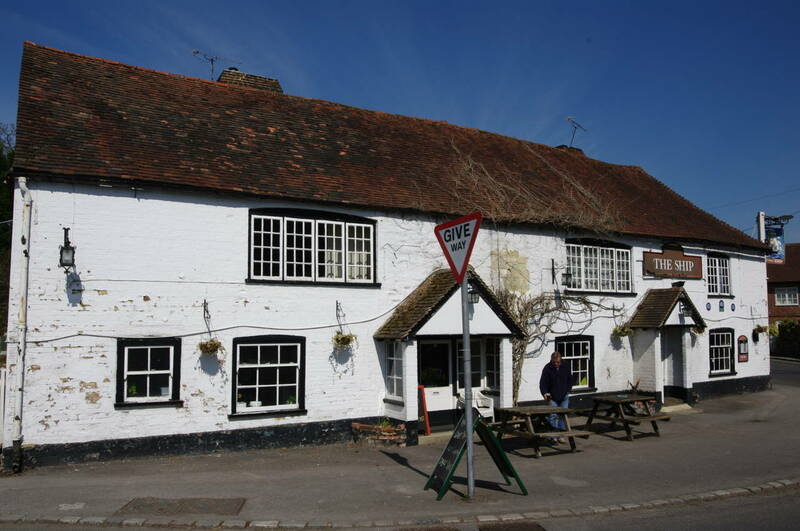 Like the Maple Inn, a sign outside indicated that it was another ninety minutes before the pub would open for the evening, and after a few moments thought I decided a little regretfully to keep walking. 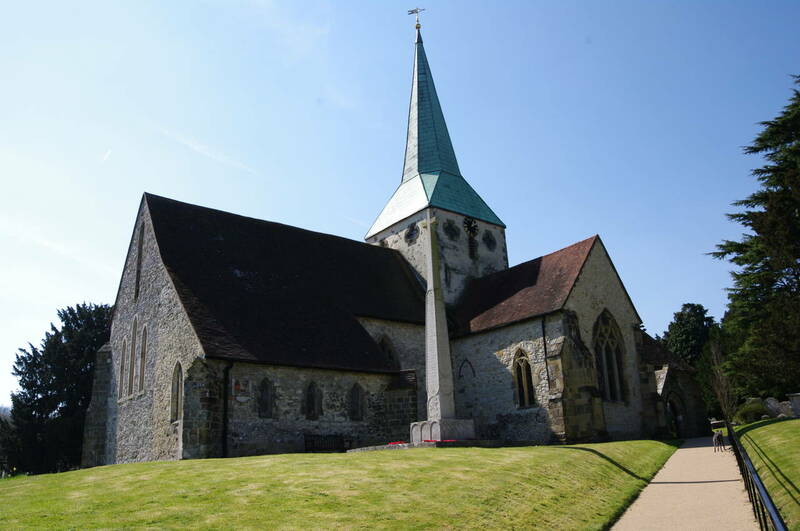 I soon reached the village duck pond and then the church (picture 40), next to which I joined the Hangars Way, which I followed for around four kilometres to reach the large town of Petersfield where I was staying the night. It didn't take me long to find my way to the town's ancient Market Square, where I found the Petersfield Kebab Van serving an enticing variety of take-away meals (apparently this enterprise is parked by the square from six til midnight every evening). 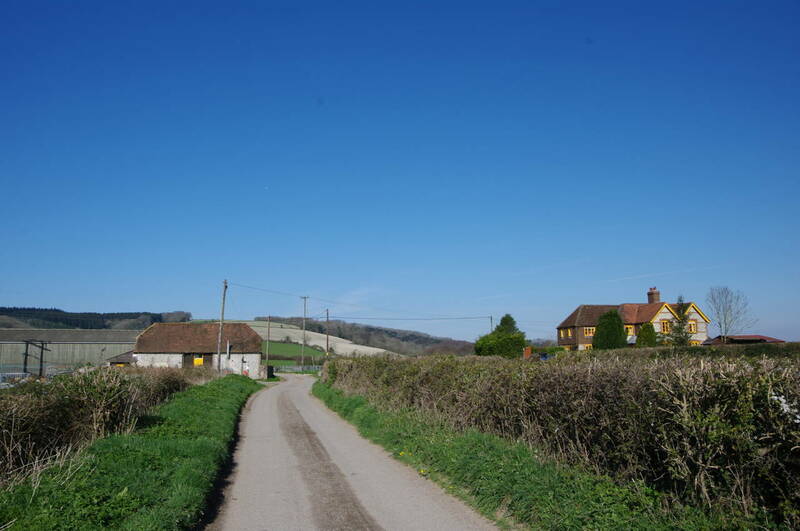 With my hunger satisfied, I retired to my accomodation to get a fairly early night, with a very long walk ahead of me to complete the South Downs Way the following day.